Heal Your Relationship with Food, Exercise, and Your Body with this One Powerful Word! What if I told you that there’s one word that has the power to heal your relationship with food, with exercise, and with your body, and it does NOT involve making a New Year’s Resolution? Creating resolutions can generate exciting ideas and visions for how you’d like your life to move in the new year. It’s fun to imagine new possibilities. But saying that you’re going to make big changes to your lifestyle is easy. Most people fail in the doing. Instead of making a resolution that you may or may not stick to, how would like to create a long-term REVOLUTION? Please be aware, what I’m going to share doesn’t involve any pills or trendy diet or exercise plan. There’s never any guilt or judgment attached. You can start it anytime, and once you do, you’ll never lose the benefits. So if any of these things are what you’re in the market for, what I’m proposing is not for you. Only read on if you’d like to leave these things behind and discover to how to live a healthier, more fulfilling lifestyle. Oh, and did I mention that it’s FREE? To fully understand the magnitude of change that’s possible for you, I want to bring a few things to light. #1. Living a healthy lifestyle today is hard! Our lives are busier than ever. It’s a real challenge for us to meet the demands of our life AND find the time to prioritize our health and well-being, especially when we have kids whose needs we rank above our own. What I’m proposing will not only enhance your health and happiness, but will also empower you to be an amazing role model for your loved ones. Win-win! #2. The media promotes healthy living, but highlights the latest diet and exercise trends, most of which focus on weight loss. I see three issues with this. One, we’ve learned that the reason to live a healthy lifestyle is to change our appearance, rather than to change how we feel. Two, we perceive a healthy lifestyle to include eating healthy and exercising, which only addresses our physical health rather than our whole health. Three, we accept dieting as a healthy way to eat, when in fact, dieting has been shown to create shame and guilt around food, rather than teaching us to make choices by listening to and honoring our bodies. What I’m proposing focuses on how you FEEL, on your WHOLE health, and teaches you to LISTEN TO and HONOR your body! #3: Big food companies are spending billions creating and marketing processed foods that are both convenient and affordable. When we (or our kids) fill up on processed food, our bodies are not receiving the nutrients they need to thrive. They can be addictive, which can negatively impact both a person’s physical health and emotional health. What I’m proposing builds your desire to say, “no thank you”. But there IS something that can release you from all of these obstacles and help you move from a love/hate relationship with food, with exercise, and with your body to a love/love relationship that will result in lasting physical, emotional, mental and spiritual health and happiness! But not only that, it will also enhance your relationship with yourself, which ultimately leads to greater joy and fulfillment! All that’s entailed is giving yourself a more affirming motivator than the ones our society offers, and consciously connecting to this motivator before you make choices for yourself. Sound too easy, even fluffy? Doesn’t make sense? I get it! But Love is exactly what healed my decade-long struggle with body-image issues, emotional eating and avoidance of all things athletic. Making Love-motivated choices was the secret to how I was back into my jeans in two weeks after all 3 of my pregnancies. It’s what kept me motivated to schlep all my babies to the gym in the rain, sleet and snow for years. It’s what’s keeps me motivated today. And it’s what I teach my kids who choose salad over French Fries! In case you’re newer to my blog, I want to share a quick story that changed everything for me. People say you are a reflection of the company you keep. I guess it’s true. Growing up, my two best friends also struggled with body-image and disordered eating issues. They were beautiful, so it never really made sense to me. But one day, their struggle impacted me differently. My heart ached as I questioned why two such lovely, special girls were making choices that were further damaging their self-esteem only to try and make themselves more worthy of other people’s love and acceptance. Later that evening, I stood in the mirror. Instead of seeing the flawed girl I usually saw looking back at me, I saw my body as a gift that God gave me that allows me to experience my life. In that moment, everything changed. I shifted my perspective of my body from criticism to gratitude. Ever since, each and every choice I make is rooted in the belief that my body is a unique and special gift that deserves to be treated with love. To me, eating whole, nutrient-rich food is a way to offer myself love. Exercising is a way to show myself love. And do you want to know what happens when you eat and exercise with Love as your motivator? Guilt, stress, criticism and judgment go away! And do you know what how eating and exercise feels when they’re done out of Love and gratitude? How does getting off the on-again, off-again roller coaster and choosing love as your motivator sound to you? 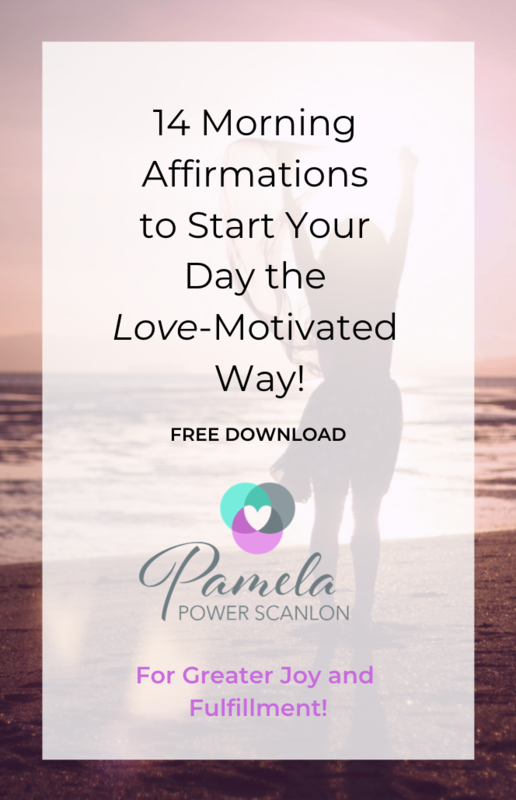 #1: Sign up for my Love-Motivated E-Letter and I’ll send you the inspiration and information to support you! #2: Comment below so I can answer your questions and cheer you on! Consider me your educator, mentor and cheerleader. You may or may not know that I’m the Mama of 3 boys and I’m crazy passionate about empowering our kids to grow up feeling healthy and happy from the inside out! So, Mama, no guilt allowed. In this space, self-care is self-LESS, not self-ish! I believe in the depth of my heart that the more love we give ourselves, the more love we have to give to others, and the more love we will bring into our world! That holds true both for us and for our children! Congratulations on taking a bold step in a more positive direction for you, for your family and for our world! Next week, I’ll share my winning strategy for how to set limits, or set points, to avoid annoying slip-ups, or worse, falling off the bandwagon. Oh I’m sorry about that. I will look into it. Not sure why that’s happening. Thank you for letting me know!